You can never grow too many onions. No matter how many I grow–and I grow a lot–I always start running out of them by now. Indeed, I can mark the growing calendar by the number of onions hanging from my rafters, and now it’s telling me to plant some, a lot, many more than last year’s couple hundred! After all, I use onions in just about every meal I make, from soup to stew to roasted vegetables and meats to the condiments (chutneys, relishes, pickles and jams)–I probably use two-three onions a day on average just for family meals, so 200 hundred onions do not last from final fall harvest to first spring picking. Eating Well’s Onions -Healthy Food Guide explains why we should be eating onions, and lots of them! I like how they play both the background, foundational note in a sauce or braise, but also how they can play a starring role. 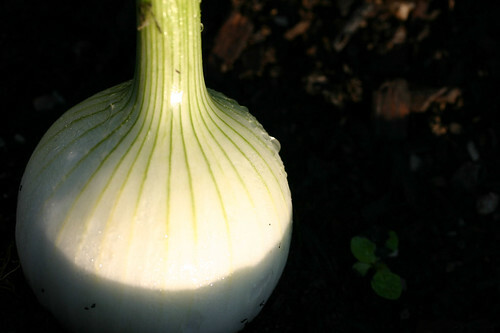 I want to try Eating Well‘s spicy onion jam recipe and the caramelized onion lasagna and the sweet onion-rhubarb sauce this year–oops, I better plant a few more seeds! Already they are everywhere in the garden, and through the season in all stages of growth; I stagger the plantings to make sure I have fresh green onions all summer as well as storage varieties to hold us through to spring. They grow in long rows along the edges of raised beds, and tucked by the threes and fours into empty slots of the garden beds. I grow the little Italian cipollini– both yellow and red varieties–sweet Walla Wallas, white onions, red slicers, Egyptian onions and Welsh. So far I’ve planted about 100 onions. The four flats of sweet onions seeded on February 22 for early transplanting–onions do fine in cold soil–are growing so fast down under the grow lights that in another couple of weeks they’ll outgrow their space. That means out through the deep snow I go to shovel off another garden bed and put up another tunnel. I don’t mind–it’s great exercise and besides, I’ll be chopping tender spring onions into my salads and soups when most people are just planting their gardens!